Our artist of the week was born in Italy with the name Michelangelo Merisi, but he has always been known as Caravaggio, which is the name of the town where he was born. Caravaggio is considered to be a Baroque artist. Baroque is an art style that began in Italy in the early 17th century. 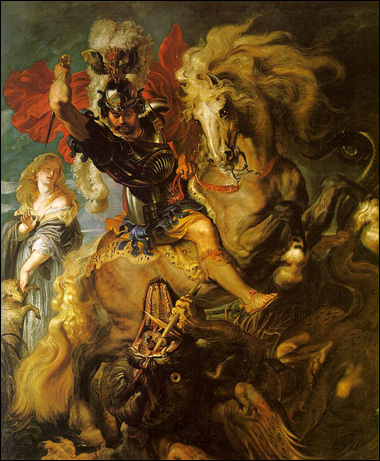 Baroque art was full of drama and grandeur, unlike the classical, idealized art of the Renaissance. 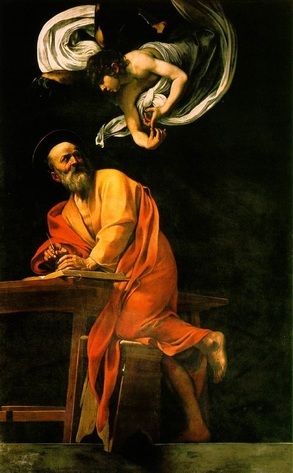 The Inspiration of St. Matthew by Caravaggio. 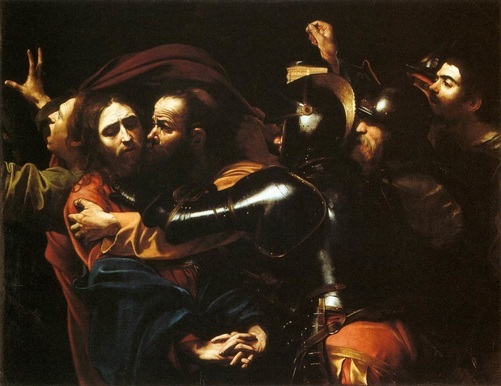 Caravaggio’s paintings are very dramatic with almost theatrical lighting. Our artwork of the week is a painting by Caravaggio called, The Inspiration of St. Matthew. 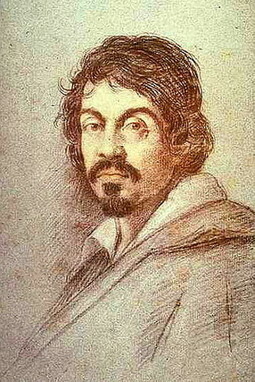 Caravaggio is considered to be one of the fathers of modern art. He was a master at using shadow and light to emphasize areas he wanted viewers to notice. In this painting, The Taking of Christ, notice how the black shadows set off the highlighted faces. One art critic said that Caravaggio's paintings were like looking at the world by flashes of lightning. His artworks seem to freeze a moment in time as a camera does, however, his paintings were completed over 200 years before the invention of the camera. Caravaggio made chiaroscuro an important element of his painting style. We learned about chiaroscuro last year with Rembrandt who used the technique, although he painted in later years. Chiaroscuro is using darkness and light within a painting for a dramatic effect. 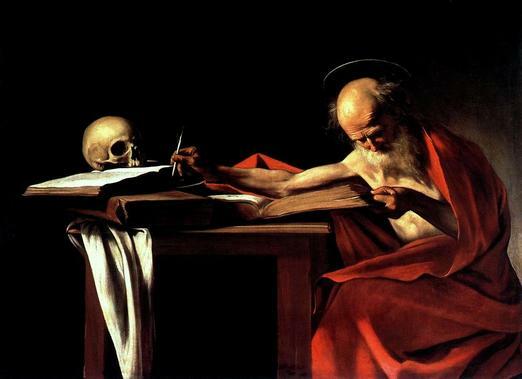 Caravaggio used high contrasts of light and dark with little in-between values. 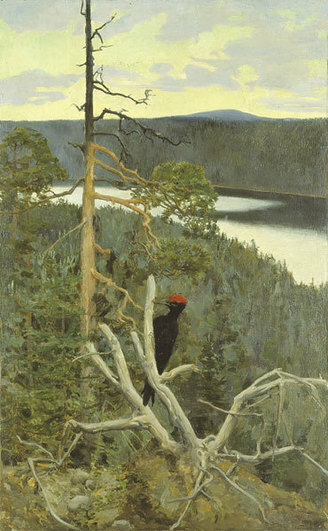 The main images of his artworks were emphasized by an almost spotlight effect, which adds much drama and interest to his paintings. Emphasis is placing importance on something, and it is a principle of design. Emphasis is a principle of design. Emphasis draws attention to parts of an artwork that the artist considers important. Caravaggio created emphasis through contrasts in value. 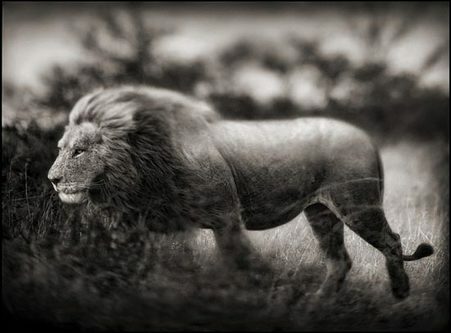 Value is the darks or lights of a picture. 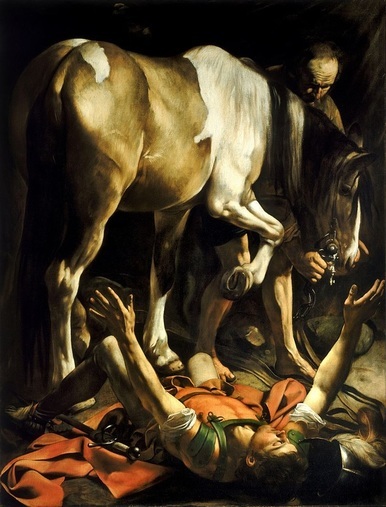 In The Conversion of Paul, our eye goes to the man (Paul) who is shown in bright light which contrasts with the black shadows surrounding him and the horse. Something that is unexpected or out of the ordinary also can create emphasis. 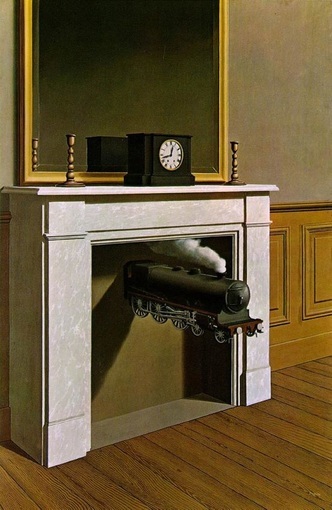 The locomotive gets our attention because it’s so surprising that it is coming out of a fireplace. 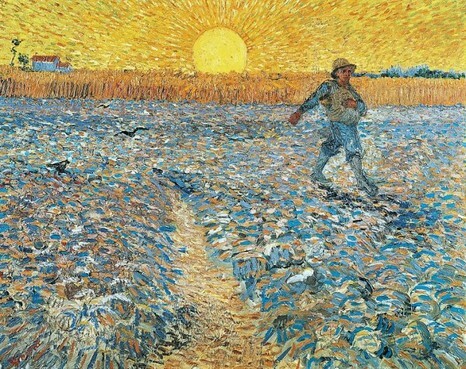 Van Gogh made the sun the emphasis of his painting. The round shape of the sun makes it stand out against the textures and other elements in the picture. Caravaggio became an orphan at thirteen. He apprenticed with a painter in Milan, Italy and then moved to Rome. 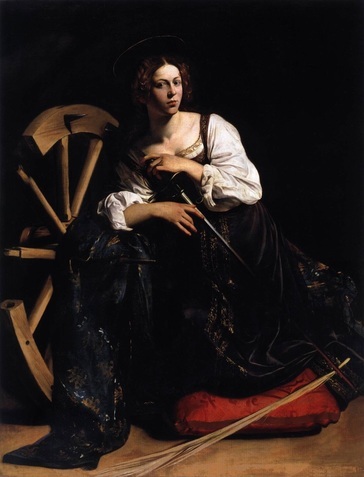 He became popular in Rome for the way he used shadow to emphasize his lighter areas, such as in the portrait of St. Catherine of Alexandria. Caravaggio had a temper and a tendency to get into fights. He died at the age of 39. Scientists in recent years discovered Caravaggio had high levels of lead in his system, which probably caused him mental problems. The paints of Caravaggio’s time period had lead in them. 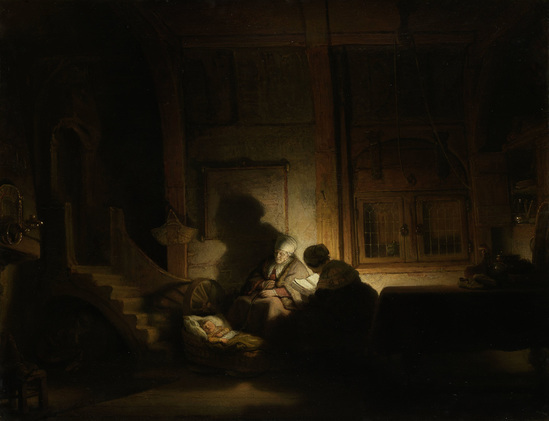 Rembrandt also used shadows and light to create emphasis in his paintings. In his painting, The Holy Family by Night, the baby Jesus and his parents draw our attention due to the lighting. 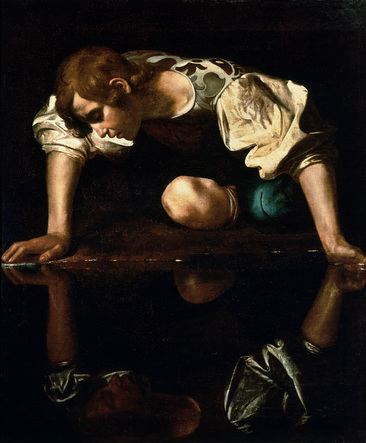 Caravaggio's painting of Narcissus sets the character from Greek mythology of by surrounding him with black shadows. When Caravaggio was just 26, he was commissioned to create paintings for a chapel in Rome in the Church of St. Louis of the French. 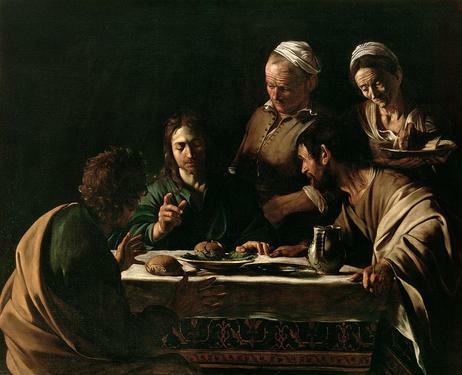 Caravaggio produced three large paintings showing different scenes from St. Matthew’s life. When people saw the paintings, they criticized them for Matthew being too human and realistic instead of more saintly and spiritual. Caravaggio always painted his subjects using everyday workers and people from the streets as his models. 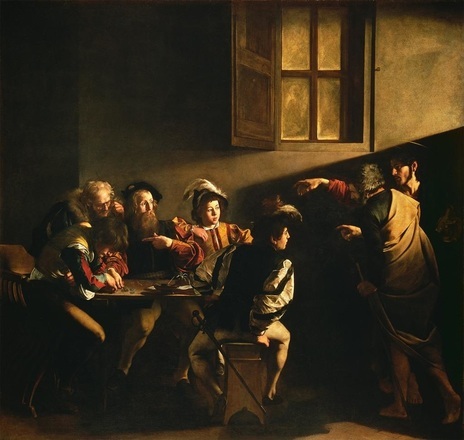 The Calling of St. Matthew depicts Matthew, who was a tax collector, sitting at a table with four other men. Jesus and Peter have entered the room, and Jesus points at Matthew, asking him to become one of his followers. A beam of light places emphasis on the faces of the men at the table. 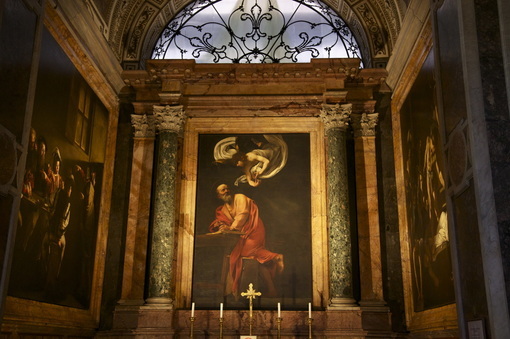 The third painting hanging in the chapel in Rome is The Martyrdom of St. Matthew. A story was believed that Matthew was killed on the orders of a king who was mad at him. 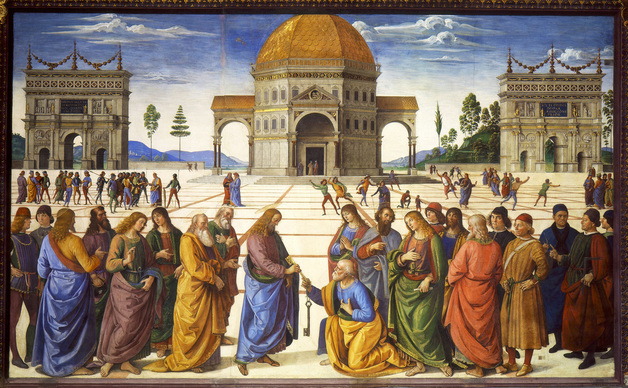 The murder of Matthew took place while he celebrated Mass at the altar. 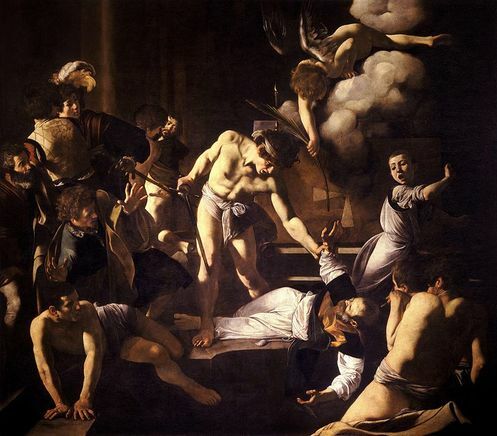 The figure in the background, behind the killer and to the left of center, is a self-portrait by Caravaggio. 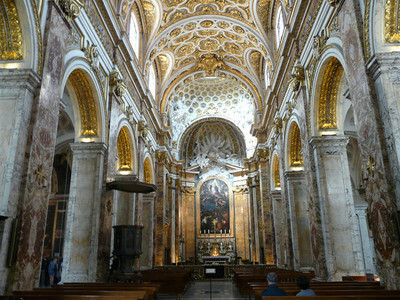 The elaborate Baroque style church, the Church of St. Louis of the French, is the national church of France in Rome.